PEPPERMINT TRUFFLE BROWNIES — Easy peppermint chocolate truffles made with a few simple ingredients. 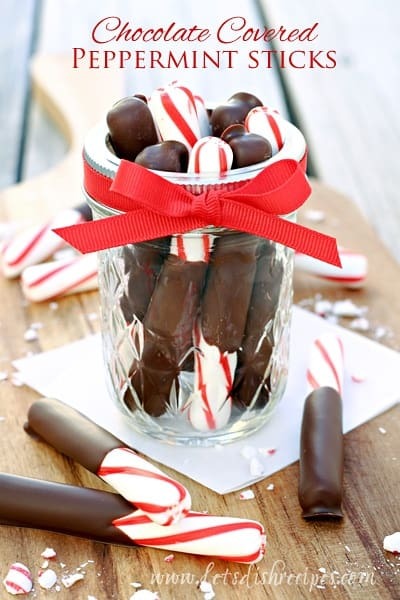 One of my favorite holiday flavor combinations is chocolate and peppermint. So it’s no wonder that I found these rich, chewy Peppermint Brownie Truffles almost impossible to resist. 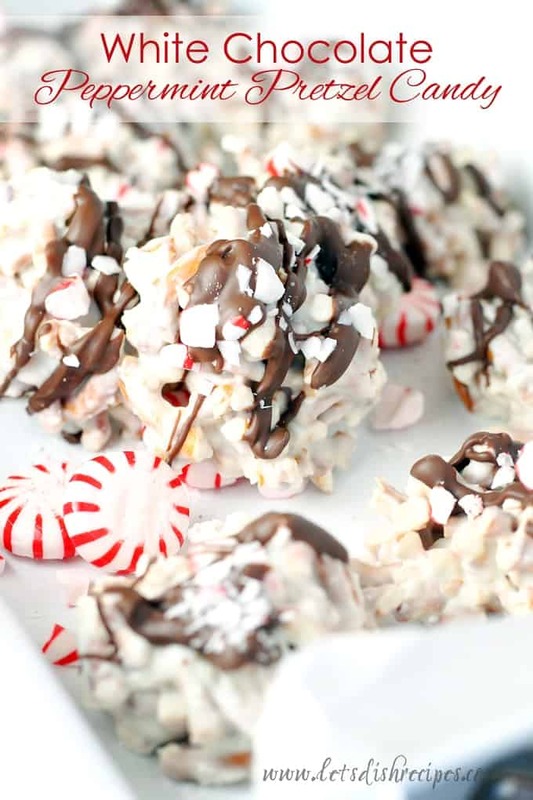 If you’re looking for a super easy holiday treat that’s sure to impress, look no further! These festive little truffles start with a boxed brownie mix, which makes them a perfect last-minute treat for your holiday cookie trays. I used a Ghirardelli brownie mix, and I definitely recommend choosing a good quality brand for these truffles. If your brownies offer instructions for both fudgy and cake-like brownies, you’ll want to make the fudgy version. And of course, you can always make your brownies from scratch! I’m always pressed for time during the month of December, so I love using the boxed mix shortcut. But starting with homemade brownies would turn out some incredibly delicious truffles. 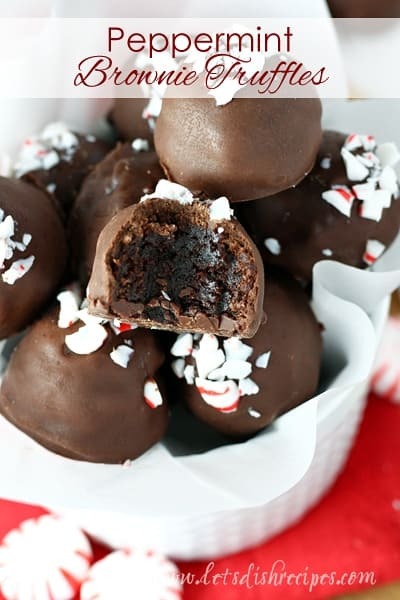 I’m not the only one who fell in love with these peppermint brownie truffles. My whole family loved them! Especially my 12 year-old. He’s been asking me for weeks to add them to my holiday baking list. Of course, I’m more than happy to oblige him. I used a small cookie scoop to make my truffles a uniform size. I opted to leave the bottoms flat, but if you prefer, you can roll the brownie filling into a ball before dipping it in chocolate. Either way, your truffles will be delicious. And you don’t have to limit yourself to milk or dark chocolate for dipping. White chocolate is also a great option. Or try a drizzle of white chocolate before adding your peppermint sprinkles. Feel free to take this recipe and make it your own with different flavorings or fun holiday sprinkles. 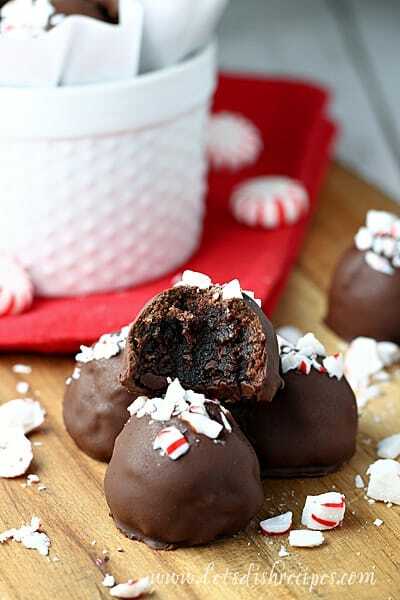 Be sure to save this Peppermint Brownie Truffles recipe to your favorite Pinterest board for later. 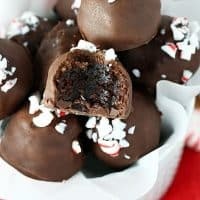 Easy peppermint chocolate truffles made with a few simple ingredients. Prepare brownies according to package directions, adding the peppermint extract to the batter as you mix. When brownies are cool, break them up into large crumbs with a fork, or your hands. Avoid the crunchy outer edges. Scoop the brownie pieces with a cookie scoop or tablespoon and form the brownie mixture into balls. Place the brownie balls on a parchment lined baking sheet and put them in the refrigerator while you melt the chocolate. Meanwhile, place your chocolate in a microwave safe bowl and microwave at 50% power for one minute; stir. Return the chocolate to the microwave at 50% power at 15 second intervals until completely melted and smooth. Dip the brownie balls into the melted chocolate, then return them to the parchment lined baking sheet. 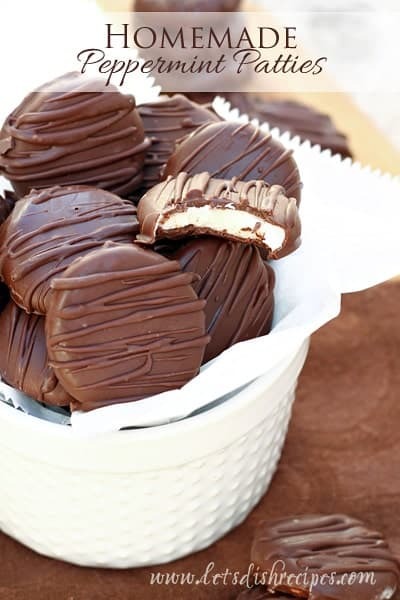 Before the chocolate sets, sprinkle the dipped truffles with crushed peppermint candies. (I dip 4-5 truffles, sprinkle with peppermint, then dip 4-5 more). Return the truffles to the refrigerator to set completely. Store in an airtight container at room temperature.